How do the first generation of digital natives view the world? Millennials, or Generation Y, the age group loosely defined as being born between 1980 and 2000, have grown up during a time of technological and economic disruption. They will be the first generation to be worse off than their parents, yet they are still expected to pick up the tab for the planet’s problems, including an ageing population, global debt and climate change. But it’s not all doom and gloom – in many ways young people will inherit a better world, one with less poverty, increased access to health care and education and huge technological possibilities. They are also the first generation of digital natives - many do not remember life without the internet. Their affinity with the technologies that have brought us to the edge of the Fourth Industrial Revolution sets them apart from previous generations. Technology has not only shaped the way they live and work, but also created a whole new set of beliefs, fears and aspirations. These values, in turn, will affect their approach to the global challenges and opportunities that lie ahead. Do young people want to change the world? Millennials already form 25% of the workforce in the US and account for over half of the population in India. By 2020 they will form 50% of the global workforce, according to a report by PWC. Are they any different to other generations in the workplace? Yes, according to the PWC research. They are the first generation to have a better grasp of the internet as a business tool than their senior managers. But it’s more than just the way they use technology. Today’s young people want a different management style and corporate culture. “They expect rapid progression, a varied and interesting career and constant feedback,” the report said. They also want to feel their work is worthwhile and that their efforts are being recognised, and value similar things in an employer brand to a consumer brand. And if they feel their expectations are not being met, they will move on quickly. Deloitte’s survey of millennials found they look for employers with similar values: seven in 10 believe their personal values are shared by the organizations they work for. 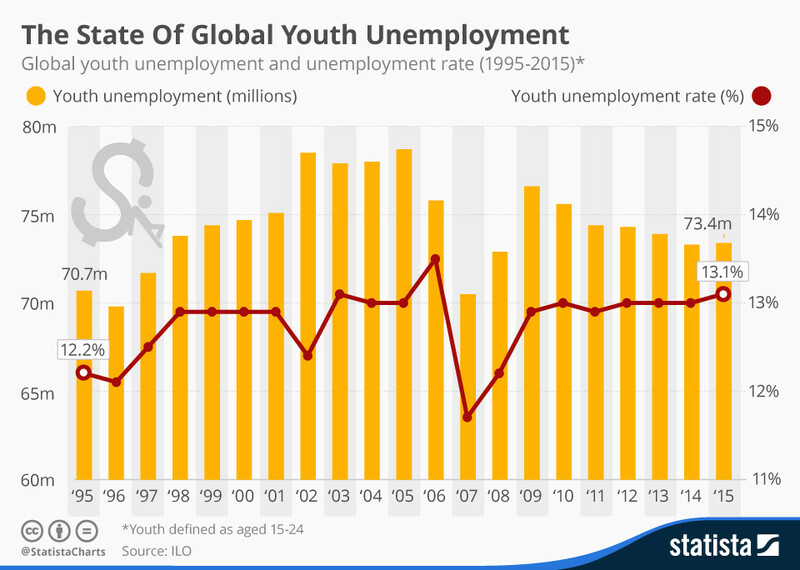 The number of young people out of work in OECD countries was nearly a third higher in 2013 than in 2007, and youth unemployment rates exceeded 25% in the same year in some European nations including Ireland, Italy, Portugal, Spain and Greece. This experience of coming of age in the grip of recession has affected young people’s outlook on life and hopes for the future. In 2013, Telefónica in partnership with the Financial Times commissioned a survey of young people aged 18-30 across 27 countries in six regions. It revealed that 63% believe it is difficult for their generation to make the transition from school to the workplace, while 39% expect to have to continue working indefinitely and say they will not have enough money to retire. The survey also found, at the time of polling, the economy was the biggest concern for young people in North America, Europe and Asia. Meanwhile in the Middle East and Africa, the most pressing issue was terrorism, and in Latin America it was social inequality. What do young people believe in? Today’s young people are in no rush to get married. A survey by Pew Research Center on American millennials in adulthood found that only 26% say “I do” between the ages of 18 and 32, compared to 36% of Generation X. According to Pew, most unmarried Millennials (69%) would like to marry, but many, especially those with lower levels of income and education, lack what they believe to be a necessary prerequisite - financial stability. A report by Goldman Sachs also says millennials have been putting off significant milestones like marriage and children. It reported that the median marriage age was now 30, compared to 23 in the 1970s. The Pew survey, which was conducted in the US, also found about three in 10 (29%) say they are not affiliated with any religion. This compares to 21% of Gen X, 16% of Baby Boomers and 9% of the Silent Generation. Millennials are far more likely to support gay rights than older generations. Some 51% of those surveyed do, compared with 37% of Gen Xers and about a third of older adults. Gen Y have reached adulthood with low levels of social trust, the Pew survey says. In response to a long-standing social science survey question, “Generally speaking, would you say that most people can be trusted or that you can’t be too careful in dealing with people,” just 19% say most people can can be trusted, compared with 31% of Gen Xers, 37% of Silents and 40% of Boomers. The Telefonica and Financial Times survey found young people have a strong belief that an education in technology will ensure future personal success. The vast majority (83%) say technology has made it easier to get a job. However, the report also said technology is creating a new gender gap as young men and women value its role differently in their lives. While 42% of men say technology is the most important field of study to become successful, only 29% of women agree. Eight in 10 young men consider themselves to be on the cutting edge of technology. Fewer than seven in 10 of their female peers say the same.